Top 10 Irish Christmas Gifts ideas 2017. Top 10 Irish Wedding Gifts 2017. What do Ireland’s county names mean? Love or hate him Conor McGregor is a UFC Champion and one of the most famous Irish Athlete's in the world. In the past 3 years he has rose up through the rants of the UFC and now dominate's the mixed martial arts arena. This Saturday a nation will stay up late to support him once again, taking on Nate Diaz in a grudge match which is set to be the biggest pay per view in UFC History. McGregor has always acknowledged the importance in his family heritage and how his Scottish ancestors fought against the English for freedom. With the big fight only two days away we thought we'd take a look at the McGregor Family Coat of Arms. "Like most ancient families, the origins of the McGregor (a Scottish surname also spelt MacGregor) clan are ultimately shrouded in mystery. What we know of the clan’s origins is a mixture of ancient tradition and verifiable fact. The clan’s motto, ‘S Rioghal Mo Dhream, meaning “Royal is our race”, reflects the family’s claimed connection to Celtic royalty. The first recorded chief of the MacGregor clan was Gregor of the Golden Bridles. They are also said to have fought alongside William Wallace, in the first Scottish war for independence. During said war, Wallace suffered a crushing defeat at the Battle of Falkirk. Historians agree that Wallace was betrayed at Falkirk but the identities of his betrayers are unknown; a popular theory holds that Robert the Bruce was one of his betrayers. If true, this would explain his later treatment of the MacGregor clan. "After Wallace’s execution, Robert the Bruce would lead the Scottish clans in their war for independence and won it, temporarily. During his reign, members of the MacGregor clan fought for him in the Battle of Bannockburn. However, despite their loyalty, Robert the Bruce took large parcels of MacGregor lands and granted them to the Campbell clan. The MacGregor holdings would continue to wane as later marriages to the Campbells and skirmishes accelerated the rival clan’s grasp on their property. This is the beginning of a pattern of disenfranchisement that would impoverish the MacGregors and produce the most resilient and heroic members of the clan." Top 10 Fathers Day Gift. Irish Gift. Coat of Arms. Heraldry. The Top Ten Most Popular Irish Surnames from Painted Clans. Hand painted Irish coat of arms with a modern twist. Top 10 Irish Wedding Gifts 2016 from the very best emerging home grown talent. Looking for Wedding or Anniversary gift ideas? I've been asked by several customers for more information about the animals that feature in their family coat of arms. Animals are broadly classified, according to their natural form, into beasts, birds, sea creatures and others. In this post I've featured on the Beast of which the lion is featured in the most in several different positions. Valiant soldier - to the death, Vigilance. In Ireland the worship of the sun in pre-Christian times was often represented by the Griffin. It later became a symbol of gold - 'yellow light'. Skillful, Politic, lover of harmony. In Ireland the Stag was one of the most ancient of charges and was regarded as the most handsome. The Stag represents the very ancestors of the Celtic race. The Lizard is an ancient heraldic symbol signifying good luck. Fierce fighter, fights to the death. In Ireland the boar is one of the most popular charges. The meat of the boar was considered to be food of the Celtic Gods. The symbol of the boar was worn in battle as a charm against injury. 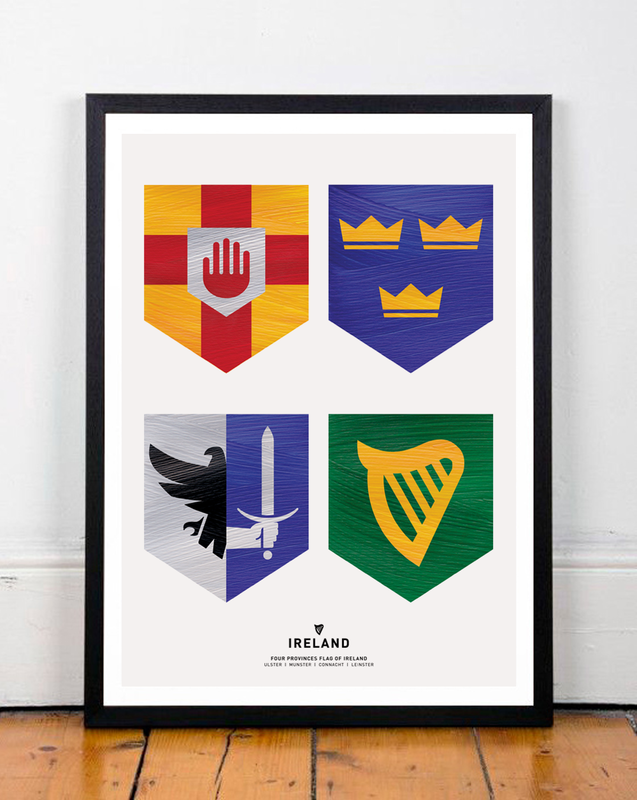 The Four Provinces Flag of Ireland embodies the rich stories of the four Kingdoms of Ireland when it was ruled by Chieftains and High Kings in the 11th Century. In modern times, the country has four provinces: Leinster in the east, Connacht in the west, Ulster in the north and Munster in the south. The Irish word for province "cúige" derives from the phrase "fifth part," a hat tip to the historical fifth province of Ireland where Co. Meath in Leinster is now. The majority of the province of Meath became part the county although more northern areas were integrated into Ulster counties. Before the Norman invasion in 1169, these five provinces existed as loosely federated kingdoms controlled by Ireland's great Irish dynastic families of Uí Néill/O'Neill (Ulster), Uí Máeilsheáchlainn/O'Melaghlin (Mide/Meath), Uí Briain/O'Brien (Munster), Uí Conchobhair/O'Conor (Connacht) and Mac Murchadha-Caomhánach/MacMurrough-Kavanagh (Leinster). I wanted to revive this rich history in a Giclee print. I focused on each element, redesigned them in a simplistic style and then gave each province a lick of paint. The prints come in two sizes A4 and A3. Each print is on 300g Acid Free Woodstock paper and comes with a backing board ready to be framed. You can purchase your Print Here and hang it in your home with pride. My good friend David recently ordered a Painted Clans crests for this parents 30th wedding anniversary. I thought i would share some images of the Mc Gettigan & Mc Quaid. I love how the colours turned out on this one, Its end up being one of my favourites that I've done to it. Since starting Painted Clans last October i've continuously thought of how I could develop my crests and create new products. The idea of family tree's seemed liked a natural progression but I had never fully defined my ideas. A few weeks ago my friend Shona living in Perth contacted me looking for a gift for her Grandad's 80th birthday. Shona and her sister wanted a "family surname tree type thing! ", Her Grandad and Granny's crest Fox and D'Arcy. Followed with their son and daughters surnames underneath it (Fox, Heffernan, Scott, McKernan & Lee). After designing the crests and double checking everything with Shona, I painted my first Family Tree Crest for Peter Fox of Co. Meath. I've heard through the grapevine that he's chuffed with it. Since i started Painted Clans last October i have seen my client base grow from family and friends to that of an international status. Thanks to my Kickstarter campaign i've seen interest from Mexcio, France, Germany, Canada and largely America. Painted Clans is not just an Irish heraldry business, It caters for all nationalities and strives to work with customers to create a piece of historical art that they will cherish and pass on as a family heirloom. Contact us of you have any questions about your family crest. The Chamberlain Coat of Arms from France. Attending a wedding this summer? Another Painted Clans crest "Tohill & Foy" heading to Castle Leslie for this weekends wedding embossed with the Castle Leslie and Painted Clans logo. Each wedding crest has the couples wedding date printed on the front along with both surnames. Attending a wedding this summer? Email brendan for previews of wedding crests. paintedclans@gmail.com. Thanks to 30 Backers i successfully raised €1,418 over 30days. I look forward to start working on the painted rewards and getting posting them out in the next few weeks. I plan on putting the funds to use soon and further market painted clans in Ireland and America. 3 Days left of my spring sale. 15% off everything. If your interested in getting a crest and want to see a digital preview of the crest before you buy it just send an email to paintedclans@gmail.com and ill get back to you asap. Sale ends this Sunday at midnight to tell your friends & family over the weekend. If you have a wedding coming up in the next few months and wanted to give the bride & groom a personalised gift that will become a cherish heirloom then a Painted Clan is the perfect gift. I recently started a kickstarter campaign to raise funds to help further market Painted Clans in Ireland and the US. I hope to raise €1,000. Until now i have funded the research and development of Painted Clans by investing our own money, as well as profit from sales of our unique family crests to date. A plotter is needed to speed up the process of transferring digital drawings into hand painted crests. This will cost €300. Check out the campaign to see what rewards are on offer. The Gaa is a corner stone of every community in Ireland and every single player and fan wears their county jersey with pride. Each county has their crest embroidered on their jersey which illustrates the history and folklore of the county. I've taken these iconic and cherished crests and put a modern simplistic spin on them whilst keeping all the elements which make up the crest. Over the next coming months i plan to design and paint all 32 counties. New edition to the Painted Clans team. Say hello to Pat the press.